Play ping pong on the go thanks to this fantastic Desktop Ping Pong set! Bring this terrific table tennis set whenever you go away on holiday and the kids are bound to stay entertained for hours! 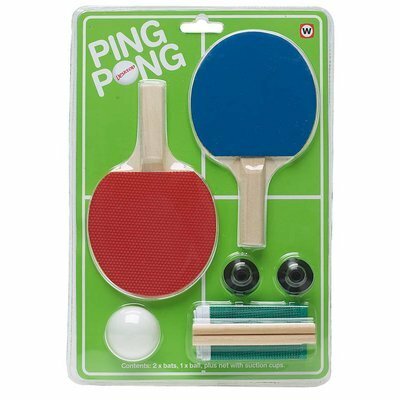 Complete with 2 wood paddles with red and blue rubber grips, a regulation ping pong ball, and a cloth net with wooden posts and suction caps so they can stand tall and strong on any surface you choose! It's even got the rules on the back of the packaging if you're unsure! 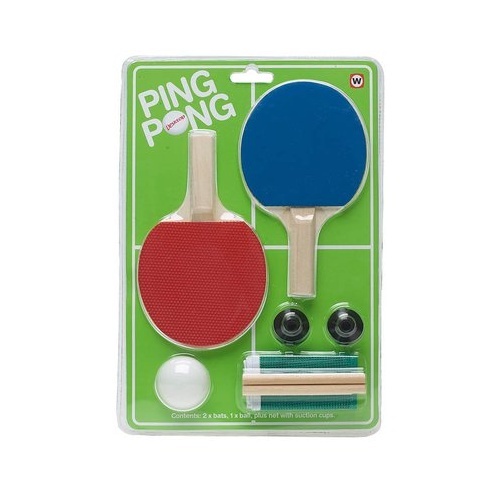 Set up the Desktop Ping Pong set and play in the dining room, office, or just about anywhere! It's perfectly portable! Also available is our Table Flick Hockey!